Palazzo Capua in George Borg Olivier Street, Sliema, is a building with a history. 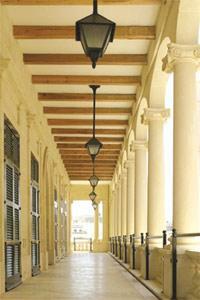 This neo-classical palace has been referred to as probably one of the oldest and finest buildings in Sliema. Its allure is further enhanced by the romance surrounding its past residents, most prominent of whom were the star-crossed residents who gave it their name, the Prince of Capua, namely Carlo di Borbone, and his Irish wife Penelope Smyth. The ill-fated Prince had been forced to live in exile outside Naples following his elopement and marriage to the lovely commoner. At the time Carlo's brother, Ferdinand II, was King of the Two Sicilies. He not only refused to acknowledge his brother's marriage, but actually plotted against him. Ferdinand, in fact, ordered the confiscation of all his brother's property in Naples. The Prince accepted all the unfortunate economic conditions imposed on him by his brother, as long as he could be allowed to live happily with Penelope. The years have gone by and time has taken its toll. Sliema today is now a bustling town - the fifth largest residential town in the Maltese Islands - no longer bearing any resemblance to the serene village it was in the early 19th century. Nevertheless, Palazzo Capua succeeds to blend harmoniously in its present-day urbanised surroundings. Today it once again stands proud and resplendent after undergoing meticulous restoration, which has returned this gem to its former glory and appearance. Palazzo Capua's story spans three centuries and is infused with romance and spangled by the events of those who resided within its stately walls. The original ownership of Palazzo Capua has been accredited to the banker and shipper, Biagio Tagliaferro, who is said to have built this palatial villa. However, the earliest established resident is said to have been a Russian banker, acknowledged to have resided at the villa, which was then known as Selma Hall. The colonnaded building itself was a fine one but did not possess massive proportions within. However, the palatial touch was achieved by a majestic staircase and gallery as its focal point. Additionally, the porticoes that surround the villa on all sides give it an elegant architectural unity and symmetry. The property did boast of a vast expanse of gardens and land surrounding it and, being built on high ground, it enjoyed some magnificent views of the sea. An advertisement in the Malta Government Gazette of January 11, 1837 refers to the property as including a coach house and stables. Andrè Zammit (The Sunday Times, March 31, 1996) refers to notes by an ancestor of his, Francesco Zammit, who was commissioned to draw up a plan of the palace and its grounds. He described it as originally being 5,131m2 , having three terraces, two coachhouses, avenues with pergolas, flower-beds, a fountain and cistern, a kitchen garden, a citrus orchard with 40 trees, as well as olive trees, vines, stone fruit trees, fig trees, prickly pears and a large number of other plants, trees and wild shrubs. Palazzo Capua is first mentioned by Thomas MacGill in his Handbook or guide for Strangers visiting Malta (1839) (quoted by A.E. Abela, 1996). He refers to it as a fine colonnaded palace built by a Russian banker, and the only building worth noting in the then village of Sliema. The actual owner, however, was Biagio Tagliaferro. Records confirm, though, that in due course the property was registered as belonging to Princess Carolina Borbone, Princess of Capua. The Prince and Princess of Capua first came to Malta in March 1837. They took up residence at Selma Hall, later to be known as Palazzo Capua, and all their children were born there. After a distressing exile imposed on them by Ferdinand II, they eventually left the islands on August 22, 1850. Following their departure a number of prominent foreigners took up residence at Palazzo Capua. In the late 1890s it was bought by the Marquis Alfred Mattei, who extended the grounds further and resided there. In 1925 the building was considered to be of architectural merit and value, and was listed as a protected building under the Protection of Antiquities Act. In 1938, alterations were made after the property ceased to be the residence of the Mattei family. Between the 1940s and the 1970s the palace also housed the Sisters of Charity of St Jean Antide Thouret. But by the 1980s Palazzo Capua had fallen into disuse and neglect, and when works in its immediate surroundings were being undertaken, the Planning Authority had cause to intervene to prevent the complete demolition of the building. It was following this that the new owner, entrepreneur Angelo Xuereb, acknowledged the potential value of restoring Palazzo Capua to its former architectural splendour. A meticulous task followed. The project was carefully planned and researched. It was undertaken in respect of the original design and excellent use was made of local artisans and master craftsmen to produce exact replicas of the original stonework utilising the best quality limestone on the islands. The reconstruction and refurbishment of Palazzo Capua is complete. It now forms part of a larger project incorporating conferencing and accommodation facilities, all in the rich architectural setting of Palazzo Capua, fully supported and operated by the Victoria Hotel. Possessing its own independent kitchen facilities, it now serves as an exclusively charming venue for elegant functions, including conferences and events.